Velocity, from Futurlab, was originally released as a Playstation Mini title, and later received an HD upgrade with Velocity Ultra, followed by a sequel entitled Velocity 2X... which is getting a physical release this Spring. 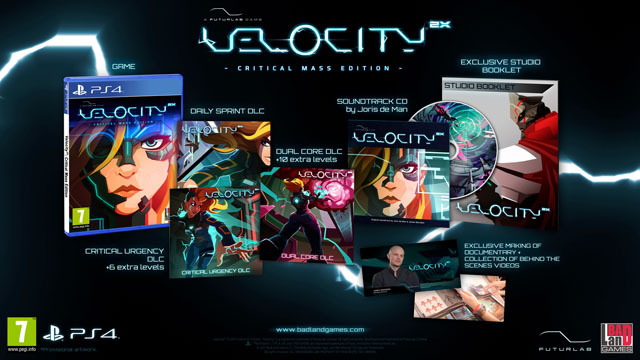 Courtesy of Badland Indie, the Velocity 2X: Critical Mass Edition physical release is coming to PS4, which includes the game itself and the Daily Sprint, Critical Urgency, and Dual Core DLC packs, as well as some behind the scenes featurettes, a booklet, and a soundtrack CD composed by by Joris de Man. A physical version is also coming to the Vita, which includes Velocity 2X and a download code for the original game. Velocity 2X sees you piloting the teleporting Quarp Jet to defeat enemies, drop bombs, solve puzzles, and teleport through solid objects. In several areas, you can dock your ship and head out for some on-foot action in sidescrolling action platforming environments. For more details, check our coverage of the game here, and the original game here.